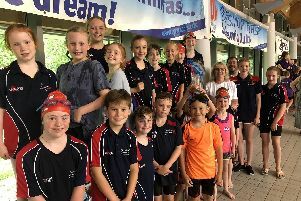 The Locks Heath Swim School following the James Moreno Meet. LOCKS HEATH SWIM SCHOOL flexed their muscle at the James Moreno Meet. The Warsash Road club picked up a total of 12 medals at The Quay, Southampton. The star of the day for Locks Heath was Toby Ellis. The ten-year-old won five medals in total. Ellis secured silver in his 50m butterfly, 100m freestyle, 100m backstroke and 200m freestyle races, as well as finishing third in the 50m backstroke. Amelia Ayling, 13, finished one gong behind with four. She was runner-up in the 400m freestyle while she grabbed bronze in the 50m and 100m butterfly and 200m freestyle. 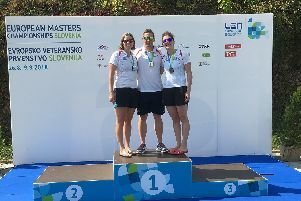 Ten-year-old Charlotte Aris is reasonably new to competing but managed to secure a silver medal in her 50m butterfly contest. Poppy Sale, 10, delivered a wonderful performance to secure third in the 50m breaststroke. Thomas Larby not only finished in second position in the 200m individual medley but the 14-year-old also set a club record in the process. Jan Stoop, 15, performed exceptionally well on the day. He may not have won medals but secured club records in the 50m freestyle, 50m backstroke and both the 50m and 100m butterfly.